In 2010 Catherine Pickering and Ralf Buckley, then associate professor and director of the ICER (International Centre for Ecotourism Research) coauthored an article investigating snow guns (also known as “snow-machines”) and their role in the undermined future of the Australian ski industry. While the Australian Alps provide an optimal environment for the six ski resorts that currently exist, Pickering and Buckley explain that each establishment will need to drastically increase snow-making activity in order to sustain skiable terrain as the level of natural snowfall decreases every year. However, after spending 9 years collecting data on natural snow cover, skier numbers, the costs and yields of snow-making in the region, the number of snow guns resorts employ, and the total costs of the guns (referring to costs of the guns themselves as well as the “associated infrastructure”) while assuming a predicted 2020 climate change-induced scenario (in which it is predicted that the mean annual temperature will increase by approximately 1.0°C and precipitation will decrease by up to 8.3%) the authors concluded that snow-based tourism in Australia will almost certainly be forced to find an alternate solution to the low natural snow levels of the years ahead. In the article, they describe a survey that suggests a significant correlation between the cover of natural snow at a resort and the number of people who visit per year, also concluding that as annual snow levels have decreased in the past two decades, people are becoming increasingly more sensitive to low snowfall. This claim is backed by a previous study which asked two groups of skiers, one in 1996 and another in 2007, how they would respond to a reduced natural snow cover, and revealed that those interviewed in the latter study were 37% more likely to ski less often with less snow. Thus, to survive the resorts may need to invest millions of dollars more per year into snow-making to compensate for the loss of natural snow, while at the same time seeing diminishing numbers of visitors per year. At some point this will become unsustainable. While snow-making alone will likely not be enough to keep the six resorts operational, it is possible that the firms will follow the example of their North American and European counterparts and adjust their business models to accommodate not only winter-based entertainment like skiing and sledding, but also year-round activities, likely putting more of a focus on the resort side of the business, allowing them to cater to a whole new sector of the market. In this approach, resorts would also likely consider expanding to make room for high cost sports like golf and boating. The main problem with this strategy is that most of these resorts are in national parks, which will limit on-site residential development and expansion into profitable mountain resort-residential towns like Whistler or Aspen. 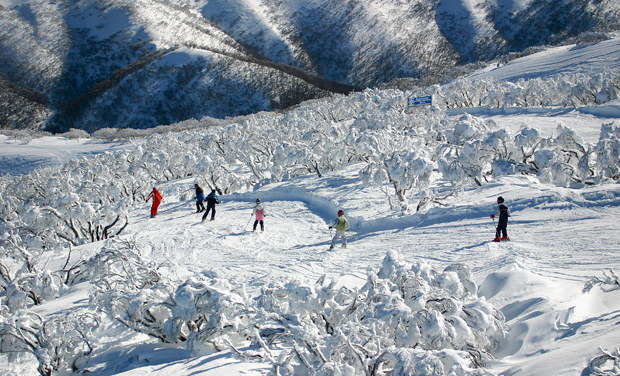 It appears that the Australian ski industry will see increased social, economic and environmental costs, and Pickering and Buckley remind us that as the mountain establishments expand, develop, and add additional snow guns to the arsenal, it is a short-term dream and the resorts are not outsmarting climate change by any means. While the sustained operation of the Australian resorts would be a victory for the industry, the entire ordeal serves as a demonstration of human short sightedness; expanded development will surely exacerbate climate change. This entry was posted in Harrison Chotzen, Tourism and tagged Australian Alps, Catherine Marina Pickering, Climate change, Environmental Sustainability, Mountain Tourism, Ralf C. Buckley by Emil Morhardt. Bookmark the permalink.